Class 7 had a great day today! 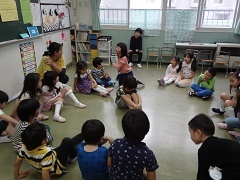 Everyone came back to kindergarten fresh from the weekend, and after exercising with Class 4, we played some phonics games and then started our Tanabata craft. 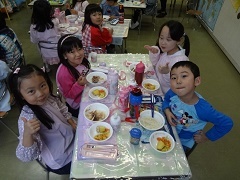 Many of the children already knew the story of Tanabata, as well as the song. 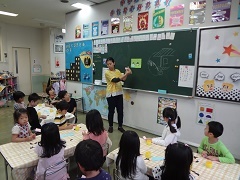 All of the children then told Mr. Ian their special wishes that they wrote to put on their finished crafts. There were many different wishes, from becoming a doctor to having lots of beautiful dresses. After a good lunch, we all played a ‘warabe uta.’ They children had fun trying to guess who was behind them. All of Class 7 are looking forward to Tanabata, and will do their best to make lovely decorations.